Also serving communities of Harrodsburg. There are 18 Assisted Living Facilities in the Danville area, with 4 in Danville and 14 nearby. The average cost of assisted living in Danville is $2,075 per month. This is lower than the national median of $3,346. To help you with your search, browse the 63 reviews below for assisted living facilities in Danville. On average, consumers rate assisted living in Danville 4.4 out of 5 stars. Better rated regions include Richmond with an average rating of 4.6 out of 5 stars. Danville, nicknamed "The Birthplace of Bluegrass," has been named one of the best places to retire in the United States by "Money" magazine. Seniors in Danville make up 18.1 percent of the population and have no shortage of assisted living homes to choose from should they be in need of daily living assistance. There are 17 assisted living facilities (ALFs) in the greater Danville area for seniors who are mostly independent but need some help with personal care, medication management, and activities of daily living. In Danville, and all of Kentucky, ALFs are regulated and licensed by the Kentucky Department for Aging and Independent Living. The Danville, Kentucky area is home to world-class medical facilities, including Ephraim McDowell Regional Medical Center, in the event of medical emergencies or illness. Located in south-central Kentucky, Danville has a temperate, if somewhat rainy, climate. The average high temperature in Danville in January is 41 degrees Fahrenheit and 86 degrees Fahrenheit in July, making Danville a pleasant place to live for seniors. Danville has an array of community resources for seniors, including the Bluegrass Area Development District, an organization that offers meals, recreational programs and transportation to seniors, as well as a senior center. Danville is safer than 60 percent of U.S. cities, and its crime rate has decreased steadily over the past few years. Unlike many other Kentucky cities, crime is not a huge problem in Danville. U.S. highways 127 and 150 cross through Danville, making it easy for seniors with cars to get around the region. For public transportation, the Blue Grass Community Action Partnership provides scheduled, fixed bus service within Danville and nearby cities. There is no senior discount for this service, but veterans and disabled persons ride free. On Tuesdays and Thursdays, the Boyle County Senior Center offers free transportation to seniors to medical appointments and other non-emergency destinations, with advance notice. It's easy to find fun and interesting things to do in the Danville area. The city is home to the Pioneer Playhouse, Kentucky's oldest outdoor theater, as well as the Central Kentucky Wildlife Refuge, the Community Arts Center and the Ephraim McDowell House Museum. Assisted Living costs in Danville start around $2,075 per month on average, while the nationwide average cost of assisted living is $4,000 per month, according to the latest figures from Genworth’s Cost of Care Survey. Danville seniors who meet the eligibility requirements will find a number of government assistance programs to help them with the cost of assisted living, such as Supplemental Security Income Category G.
To see a list of free assisted living resources in Danville, please visit our Assisted Living in Kentucky page. 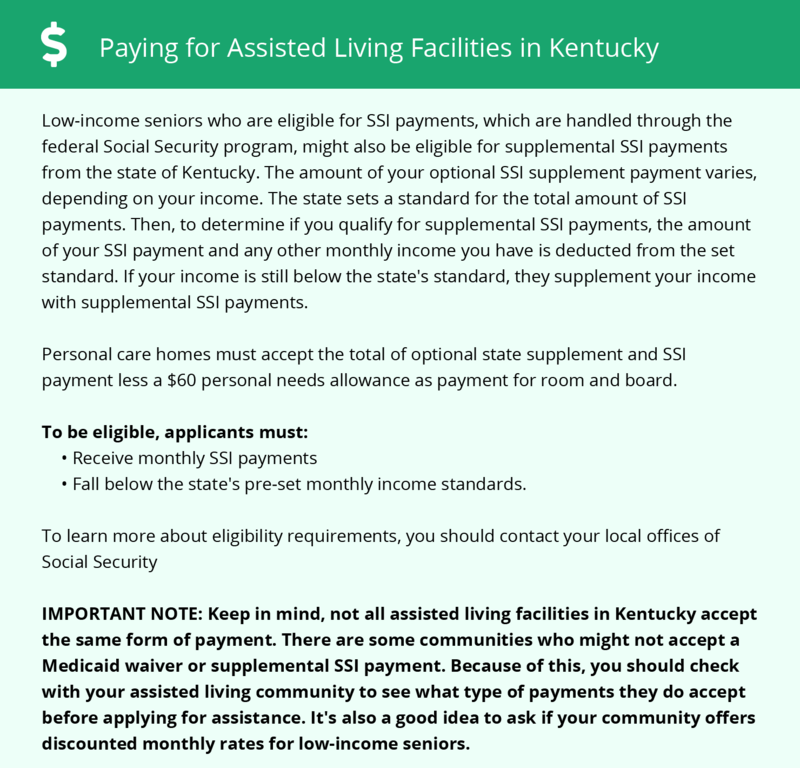 Danville-area assisted living communities must adhere to the comprehensive set of state laws and regulations that all assisted living communities in Kentucky are required to follow. Visit our Assisted Living in Kentucky page for more information about these laws.